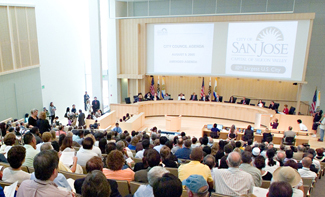 The City of San José operates under the Council/Manager form of government, a system that combines the policy leadership of elected officials in the form of a city council, with the managerial expertise of an appointed city manager. The Council is the legislative body that represents the community and is empowered by the City Charter to formulate citywide policy. The City Council is comprised of the Mayor, who is elected by the community at-large, and ten councilmembers who are elected by districts. Under the City Charter, the Mayor is responsible for recommending policy, program and budget priorities to the City Council, which in turn approves policy direction for the City. The City Charter limits the Mayor and Councilmembers from serving more than two consecutive terms. The City Manager is appointed by the Council and serves as the chief administrative officer of the organization. The City Manager is responsible for administration of City affairs, day-to-day operations, and implementation of Council policies. The City Attorney, also appointed by the Council, advises and represents the City and Council in all legal affairs. Council meetings begin at 1:30 p.m. on Tuesdays. In addition, on the first and third Tuesdays, there are evening meetings, which begin at 7 p.m. Council meetings can be seen on Cable Channel 26, or viewed online. If there are issues that you wish to bring to the attention of the Mayor or the Councilmember representing the district in which you live, visit the City Council page to contact them. If you are unsure which Council district you reside in, check the map of Council districts.